Fiction University: Happy Release Day for Kelly Mendig! Happy Release Day for Kelly Mendig! 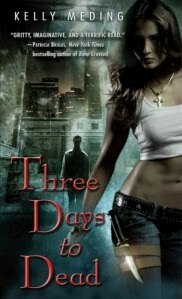 Grats on the debut release of Kelly Meding's urban fantasy, Three Days to Dead. Kelly is a friend from the Absolute Write boards, and she's about the nicest and most helpful person you'll meet over there. Hmm, that sounds interesting. Thanks for posting about it.